I've been thinking a lot about focus lately...in my running, in my art, in life! I'm a big picture person which has many advantages, but like any gift, it has it's downside, like becoming lost, overwhelmed, or just plain confused. I attended my first yoga class today and found that much of yoga is about focus. It was hard for me in many ways, so I think it will be good for me. I've already shared my thoughts about focus during running. 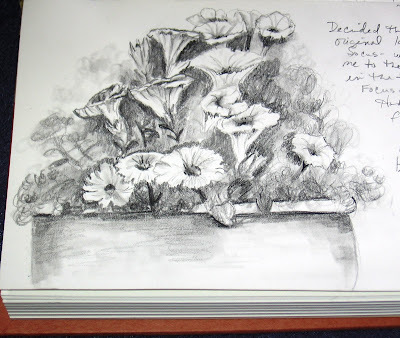 My latest drawings in my illustrated journal bring this into, well, shall I say it? FOCUS! 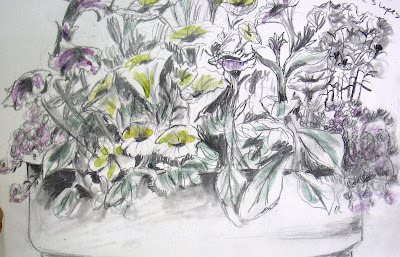 There is a container on my back deck full of flowers that have drawn my eye as a possible drawing subject for practice. When I had completed the drawing (adding a little watercolor wash for color), I was dissatisfied with it. I decided that it lacked focus. So I asked myself what had drawn me to this subject in the first place. 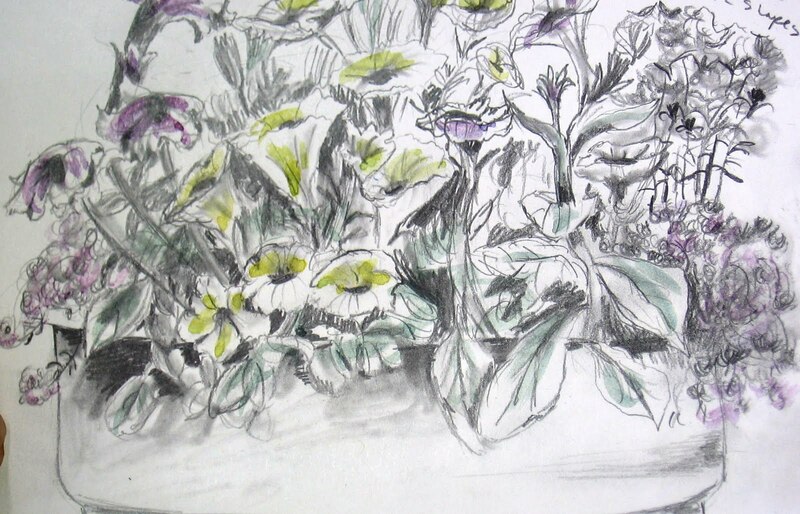 I realized that it was the yellow flowers in particular, so I decided to redraw the container, focusing on the yellow flowers only, leaving the rest more to the imagination. I felt the drawing was much more satisfying. Art is a person's unique view of the world, presented for the viewer to experience. Finding my focus is finding and presenting my unique view. What a gift your insights are! Many of us try to take in the whole view, and so we miss the up close and personal.I think that's why it's so hard to stay in the "now" moment.We keep thinking about future things, so we miss what's in front of us.Love your pictures- your journal is a treasure that will become a keepsake and joy for those you love.